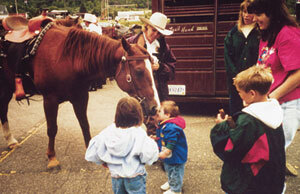 The Minnesota Horse Expo is a not-for-profit event sponsored by the Minnesota Horse Council. The Expo brings a variety of speakers, vendors, and horses to the Minnesota State Fairgrounds every April to educate horse owners and horse fans. Visitors can choose from clinics and lectures, demonstrations, vendor exhibits, walking through the horse barn, horse and pony rides, carriage rides and more. Funds generated by the Expo are used by the Council to support MHC's scholarships, grants, direct funding and trail improvement grants. Over the years, more than three million dollars has been raised at this event -- primarily through the efforts of volunteers. The 2018 Horse Expo will be our 36th! Visit the Horse Expo website.